Postage UK - next day delivery - £11 Europe - £14 Rest of the world - £18 *Please select the correct delivery area to avoid delaying your order. Neuromotor Immaturity in Children and Adults makes proven tests available for the first time to the health community at large, allowing practitioners to test for neuromotor immaturity and provide help if required. 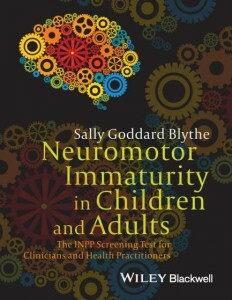 Sally Goddard Blythe is a Consultant in Neuro-Develpmental Education and Director of The Institute for Neuro-Physiological Psychology (INPP). She is the author of several books and published papers on child development and neuro-developmental factors in specific learning difficulties, including, Reflexes, Learning and Behaviour (2002), The Well Balances Child (2003), What Babies and Children Really Need (2008), Attention, Balance and Coordination – the A.B.C of Learning Success (Wiley-Blackwell, 2009), The Genius of Natural Childhood (2011), and Assesing Neuromotor Readiness for Learning (Wiley Blackwell 2012).